This is a 1 move tsume problem with extra pieces in hand for novices. In a real game of shogi, you usually have several kinds of pieces in hand in the endgame and so you often have to choose an appropriate piece to move or drop. In the diagram, you have a Rook, a Gold, aSilver and a Lance in hand. What do you think is the correct move to checkmate with your Pawn on 5c? 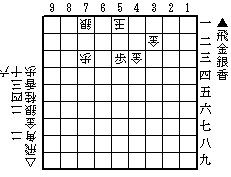 Tip - There is a shogi proverb. "Use a Gold in the end. (Kin ha Todome ni Tsukae)"
The answer will show up in the comment section later. Dropping any other piece could not checkmate the king. It's important to select a right piece to drop for winning a game.